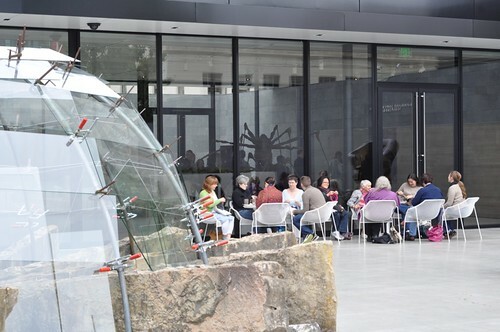 Adrienne decided to put a call out to Bay Area Knitters - to meet up at the SFMOMA for a morning of knitting. 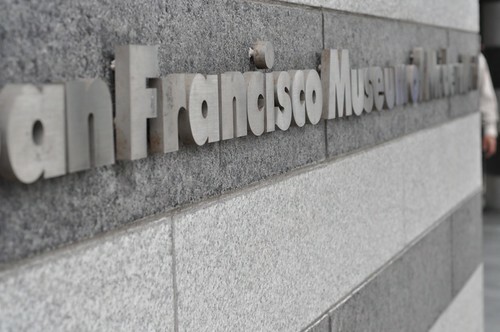 Recently, the SFMOMA built a new sculpture garden on its roof. 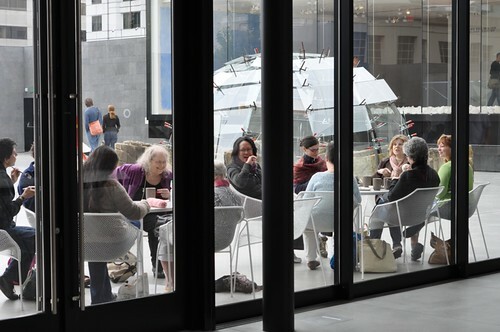 And, to sweeten the deal, they added a cafe which serves fancy pastries and cakes as well as the Bay Area infamous Blue Bottle Coffee. Sometimes when I drink it, I feel like I am floating - sometimes I see sparkles. Earlier in the week, Leah Garchik, a reporter for the SF Chronicle, included this most recent exploit of Adrienne's in the paper. Adrienne was running around the studio yelling "I'm in the paper. And, my name is even in bold". Otherwise, she had put a call out to Ravelry. Funny enough, we have 3 knitters join us from reading about it in the paper - which was really cool - and adventurous of them. 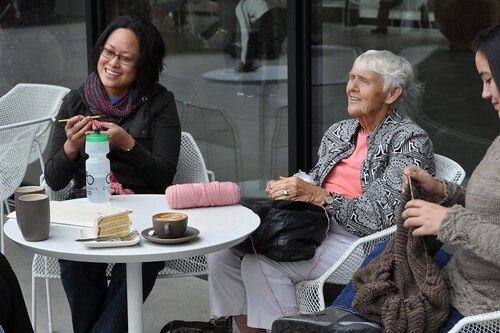 Knitters came from as far south as San Jose and as far north as Larkspur. 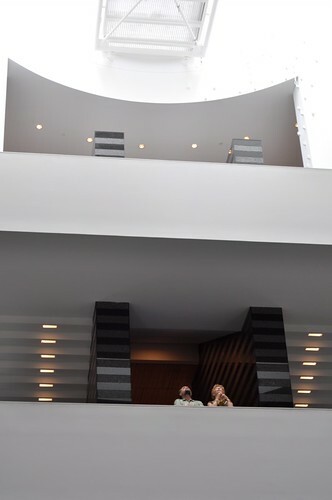 Also, many people who were there to look at art, asked to take our photo, as if we were a 1970's performance art piece - and we were just knitting - imagine if we were spinning?! Oh, I so wanted to come, but I was in Santa Cruz this weekend :( Tthere has to be a next time!! I wanne be there with you guys! Looks and sounds like it was a blast! I'm so sorry I missed that awesome rothko-esque cake! At some point in the future we *should* go there to spin. I had so much fun! We will need to do this event again. Great pictures Kristine. Can we possibly schedule one when I am in town visiting in October? 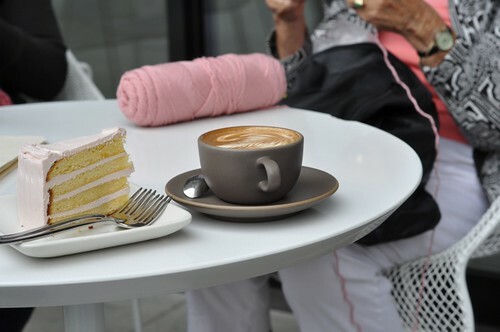 You know how much Momma loves delicious lattes, yummy desserts and of course, knitting. I'd love to come to the next one. This last weekend I was busy helping a friend move (believe me, I'd rather have been at MOMA) I'm happy to bring my wheel next time too. I'm so sorry I missed it! Have wheel, will definitely travel. Just let me know where and when. 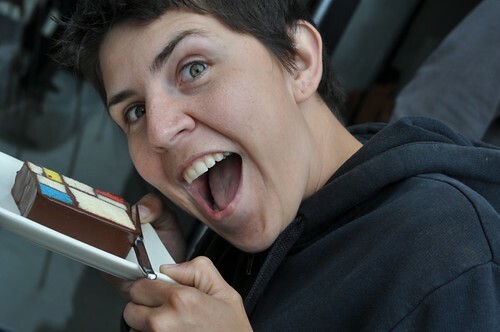 Oh my gosh, LOOK at that cake!! That sounds wonderful. I would totally spin there! Even if it meant toting my wheel from BART. 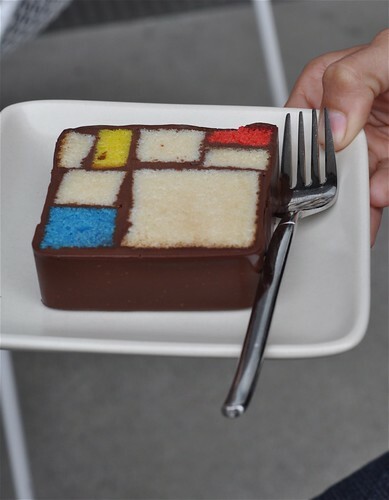 I love the Mondrian cake! And Congrats to Adrienne for getting in the paper!